IAO is an international quality assurance agency, working to improve quality assurance standards of organizations all over the world. With its global network of experts, IAO grants accreditation to educational institutions, corporations, education provider professionals and qualified individuals. In reference to your prestigious institutes' accreditation with IAO, we would like to congratulate you on the successful completion of the full accreditation process based on the on-site inspection visit carried out recently by our appointed chapter member, Ms. Evelyn Dhanso. Some of the key factors that helped us reach the conclusion of your assessment include, but are not limited to the fact that the pair of institutes, both in Sudan and UK, are fairly new in terms of establishment. 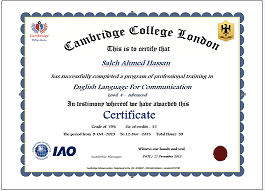 The UK institute received it's registration this very year and is operating as a distance learning center at the moment. The institute has a prominent Mission and vision statement and a qualified and active board of directors which overlooks all operations, with Dr. Salah acting as the CEO and spearheading the entire operation himself. The institute has a fairly transparent statement of policies and allows the faculty to pursue research to improve their professional and academic backgrounds, at present roughly 40% of the faculty are pursuing professional research and 100% of schools Exams. The institute has a respectable 85% attendance rate, 12/1 teachers in schools while offering University of Cambridge Primary and Secondary Programs including Check Point and IGSCE . Faculty and Training Centres offers 3 major courses, including Certificates, Diplomas and Distance Learning certifications, the complete list of courses has been provided to IAO by the chapter member. The institute is also pursuing further accreditation with other bodies besides IAO as well, including ISO 9001. Ms. Evelyn remarked that out of the entire process, what impressed her the most was the passion shown by Dr. Salah during the audit process and his willingness to assist in any way he could to help ensure the successful completion of the inspection itself. IAO commends Dr. Salah for his work and hopes this is the beginning of a long and prosperous relationship. The end result of all the above research, assessment and praise being IAO's management coming to the conclusion that the pair of institutes qualify for IAO's prestigious accreditation with satisfactory results. 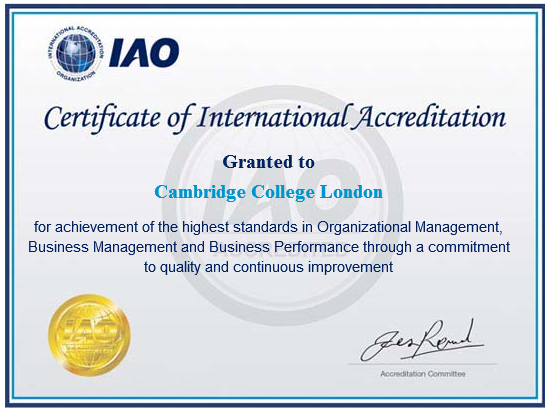 This will result in IAO formally recognizing your institute as an IAO accredited organization.